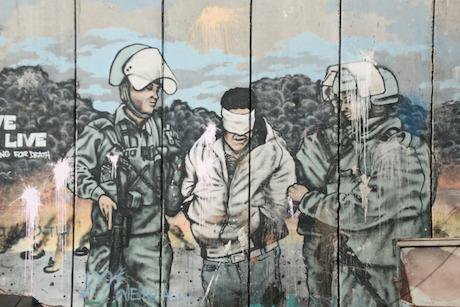 Views of the wall of separation near the Aida refugee camp in Bethlehem. Richard Gray EMPICS Entertainment. Press Association Images. All rights reserved.The Indian Prime Minister Narendra Modi, in one of his recent chest-thumping speeches, compared the Indian forces with those of Israel. Modi’s comparison came within the context of the Indian Army claiming to have carried out “surgical strikes” across the LoC and dismantling launch pads used by the Pakistani-sponsored militant groups to infiltrate across the de facto border that divides India and Pakistan held Kashmir. Now, if we bend-over backwards and accept this claim, dismissing the scepticism that various international media agencies, such as CNN, BBC and Washington Post – establishments that usually spare no chance portraying Pakistan as a virtually rogue state – expressed over these strikes, the question that still begs an answer is, even from the Indian point of view, did this act induce any substantial change in the vexing political scenario of Kashmir? The scale of India and Israel’s cooperation is underlined by the Indian President Pranab Mukherjee’s welcome speech to his Israeli counterpart during Reuvin Rivlin’s visit to the country. "India admires the people of Israel for all that you have accomplished," Mukherjee said in his pre-dinner speech. Coming back to Modi’s Freudian slip, the Israeli treatment of Palestinians might serve as an ideal vantage point to scrutinize Indian rule over Kashmir. Besides being one of Israel’s largest defence customers, Indians in the past have sought Israeli expertise to quell mass street protests in Kashmir. While there is a near unanimous stand within the international community over the status of post-1967 West Bank – a pervasive military occupation that needs to end for any sustainable peace – Kashmir does not hold the same designation. With more than half a million Indian forces spread across the region’s landscape, in recent days, powerful voices across the ideological spectrum have not shied away from assigning a similar label to India’s reign in Kashmir. However, elections do not always equate to a just arrangement. The Judenräte or Jewish Councils in Nazi-occupied parts of Europe were elected bodies too, as is the Palestinian Authority in Occupied West Bank. Plus, the military occupiers in modern times prefer to project a civilian face and steer clear of their responsibilities under international law. Moreover, if a ruling dispensation survives 134 days of widespread protests and all-encompassing strikes, it is safe to conclude that they derive their legitimacy from a source other than the people. In the case of Kashmir, the source of course is the metropole of New Delhi. The Isreali treatment of its Palestinian (Arab) citizens and residents of occupied territories is often compared with the South African apartheid system. Archbishop Desmond Tutu, UN Special Rapporteur on Palestine Richard Falk and even the US Secretary of State John Kerry made this analogy. In the light of Armed Forces Special Powers Act, a law that gives the Indian forces deployed in Kashmir sweeping powers over the life, liberty and property of Kashmiris and renders them immune from prosecution; Public Safety Act, an archaic law similar to Israel’s Administrative Detention, under which a person can be detained without trial for up to two years and other discriminatory, rights-robbing legislations, Indian conduct in Kashmir has to be probed within the same framework. However, since the racial factor doesn’t apply between India and Kashmir, the situation can be described as a more subtle, undetectable form of apartheid. A system of neo-apartheid. The 1948 ethnic cleansing of Palestine and subsequent formation of the state of Israel is viewed as a massive catastrophe (Al-Nakba) in the entire Arab world. In recent times, even Israel’s own “new historians”, such as Avi Shlaim and Ilan Pappe have written authoritative accounts on how Israelis expelled hundreds of thousands of Palestinians, destroyed Palestinian towns, villages and constructed their Zionist project on the ruins of historic Palestine. Kashmir’s “accession” to India, the validity of which remains hotly disputed, was also surrounded by a ferocious intensity of death and displacement. While the Indian narrative maintains that its troops landed in Srinagar to “rescue Kashmiris from the destruction unleashed by tribal raiders from Pakistan,” the reality presents a different picture. India’s intentions, at best, are more likely to be the preservation of the tyrant Dogra regime and, at worst, a straightforward territorial assimilation. If the Indian government of the time would have been genuinely concerned about the safety of Kashmir’s people, the troops should have landed in Jammu, the southernmost region of erstwhile independent Jammu and Kashmir state, not inside the valley because Jammu was the focus of a virtual genocide through the autumn of 1947. The Dogra Maharaja troops, in tacit collaboration with RSS goons – the same neo-fascist organization that forms the ideological backbone of India’s currentruling BJP party – killed an upwards of 237,000 Muslims in Jammu according to various international newspaper reports of the time. Around 123 villages were completely depopulated of Muslims, thereby altering the region’s demography. Pertinent to mention here is that while the Kashmiris observe 27 October, the day on which Indian troops landed in Srinagar, as a black day every year, numerous groups in India celebrate it – not unlike the 15 May Israeli celebration of Al-Nakba as Yom Ha'atzmaut (Independence Day). The Indian Army and paramilitaries occupy more than 1500 square kilometres of land in Kashmir. This is three times the total municipal jurisdictional areas held by settlers in the occupied West Bank or approximately equal to the territory of Bahrain and Singapore combined. A significant portion of this land is highly cultivable with the potential of producing cash crops like almonds, saffron and apples. The structures erected by the Indian forces are not confined to the fringe but operate within residential areas and occupy community spaces like playgrounds, cinemas, schools hospitals and post-offices. The presence of mammoth army cantonments on the foothills of cities shut down any prospects of upward urbanization forcing the population to build new houses and business establishments on the flood-prone lowlands that are essentially catchment areas. This not only puts people’s lives and security at risk but also contributes to disastrous environmental stress. Also, the occupation and minelaying of numerous hill-stations and resorts by the Indian Army makes these potential recreational spaces inaccessible. Kashmiri and Palestinian conditions can also be correlated on a host of other matters like military checkpoints, cultural assimilation, abuse of children, torture and denial of free cross-border movement etc. While the resistance leadership, during the current phase of mass-uprisings, has come-up with ingenious ways of protest, such as the use of the 5 PM break in general strike to express dissent and establish an almost parallel governance structure Kashmiris surely can take away multiple lessons from the Palestinian experience. On the diplomatic front, while far from being successful, Palestine is eons ahead of Kashmir. Despite the obvious shortcomings of Oslo and Camp David, acquiring a non-member observer state status in UN against such heavy odds is no less an accomplishment. Kashmir, however, remains to be on the backburner in the international diplomatic scene. Having a strong diplomatic outreach shall not only prevent Kashmir from regularly turning into a cold conflict that is unworthy of a permanent resolution, but will also allow Kashmiris to be relatively flexible and not entirely dependent on a group of countries like OIC whose own human-rights records do not even present a decent, let alone ideal picture. While it is impossible to entirely ameliorate the effects of geopolitics, an indigenous diplomatic front shall ensure that Kashmiris do not solely depend on the whims of powerful states like Russia, having left a trail of murder from Grozny to Eastern Aleppo; China, whose abuses from Tibet to East Turkestan are no secret; and the United States, the mothership of domestic police abuses and international war crimes. The Palestinian Boycott, Divestment and Sanctions (BDS) movement is another powerful mode of protest that can be applied to the Kashmiri setting. Since India immensely values its international market image, lobbying businesses to divest from Indian economy, while highlighting the state abuses in Kashmir, will surely help in putting pressure on the country’s ruling elite to find a sustainable political solution to Kashmir’s long-pending dispute. Similarly, encouraging an educational and cultural boycott of India can prove to be helpful to buttress the non-violent Kashmiri resistance. This piece was first published on the blog of Cafe Dissensus Magazine on 22 November 2016.